I will state this now: I do NOT condone any types of violence at all. Please keep this in mind throughout this post. This week's tutorial paper posed a question which is at the heart of a heated debate: Who is responsible for school violence? Similarly to Ohsako, I determined violence can be caused by five different sources. Depending on the country, state/province, and community, these factors can vary in degree and applicability. Many of these come from Ohsaka (1997, p. 13-4), although some other studies by Oliver and Candappa (2007) and Yaakov Iram (1997) are represented. 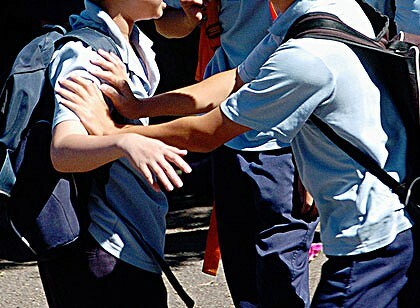 Like I said, there are many different causes of school violence, all unique to certain communities, cultures, and societies. I think the absolute worst thing we can do is blame violence on one thing (like gun control) and widen our scope, looking at all possible causes and solutions. I also think we can realize that many districts take preventing violence "to the max" and adopt useless and ridiculous "zero tolerance" policies which do nothing but encourage overreaction and knee-jerking. For their part, the media should not rile the public up about how one thing is causing the destruction of our schools when clearly that's not probable: it will always be a multitude of causes which impact schools. You make several good points. There are also cases of "angel child" syndrome with teachers too. I had an experience where a teacher believed that one student could do no wrong, and as such turned a blind eye to another student being bullied by the first because of this. Also, wish you were going to be with us in Atl. this year. I'm glad that you see this issue as having many sources -- too often in education, we are quick to blame one source of an issue, "demonize" that source, and respond by saying -- "it's their fault -- nothing we can do." Great educators recognize that when a problem has multiple sources, such as school violence, there is no one magic "quick fix" -- instead, a strategic plan, based on fact and not supposition, grounded in research, and executed with passion is always more effective -- both long-term and short-term. What can we do as educational leaders? Promote solutions for both the long-term and short-term. It is my belief that violence is part human nature (from the survival "fight or flight" instinct), and part taught and reinforced. Anything that is learned can also be un-learned -- and as teachers and administrators, it is our job to help students "un-learn" violent behaviors. Is this in the Common Core State Standards ? Absolutely not! Is it one of the most important lessons we can teach our young men (and women) early in life for short-term and long-term success ? Absolutely.